Three men are charged in a "Grandparents scam" where $80,000 was extorted from a New York man. 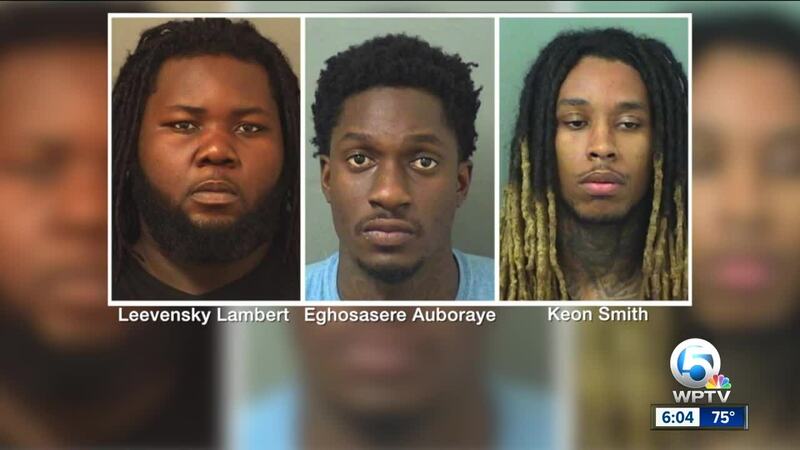 SUBURBAN BOYNTON BEACH, Fla. -- Three men were arrested and are facing charges including Grand Theft and Conspiracy to Commit Extortion after the Palm Beach County Sheriff's Office says they extorted $80,000 from a New York man. The scam involves tricking elderly victims into believing their grandson or granddaughter is in jail and needs a large sum of money. On Tuesday, February 5, 2019, a 78-year-old man in East Norwich, New York received a phone call from a person claiming to be his grandson "Austin". The caller advised the victim that he was in a car accident and needed help. The caller told the victim he was with an attorney named "Michael Spencer". Spencer told the victim that Austin was being held on bail and needed $9,800 to be sent via FedEx to an address in Surfside, Florida. The next day the victim received another phone call where he was informed that one of the passengers in the vehicle were pressing charges and they needed more money. The victim was instructed to send $18,000 to a Miami address via FedEx. The following day, Thursday, February 7, the victim received another call from a person claiming to be an attorney named "Marc Rockwell". The victim was instructed to send $30,200 or else Austin would have a warrant out for his arrest. The victim was told to send the cash to a Greenacres address. On Friday, February 8, 2019, the victim received another call from "Marc Rockwell" telling him he needed to send another $22,000 to a suburban Boynton Beach address via FedEx. On Saturday, February 9, 2019, the Palm Beach County Sheriff's Office was advised that the package containing $22,000 was supposed to be delivered between 8 a.m. and 10 a.m.
Deputies monitored the address in an unmarked vehicle and saw a blue Hyundai with a black male in the driver's seat parked at the Aberdeen community's clubhouse. Once a FedEx truck delivered the package to the intended address, deputies witnessed one of the men from the Hyundai walk to the front door of the home, enter the screened-in area and retrieve the package. The suspect, later identified as Leevansky Lambert, was taken into custody. At that time deputies observed two other men in the vehicle, who were later identified as Eghosasere Auboraye and Keon Smith. The FedEx package was kept sealed and opened in an interview room at PBSO District 6 DB. Inside the package was a total of $22,000 in $100 bills. All three suspects were interviewed by detectives and charged with Burglary (2 counts), Conspiracy to Commit Burglary (2 counts), Grand Theft over 20K (2counts), Conspiracy to Commit Grand Theft over 20K (2 counts), Extortion, and Conspiracy to Commit Extortion. Law enforcement officials say it's a good idea to discuss this type of scam with your elderly family members so they'll be less likely to fall victim to it.